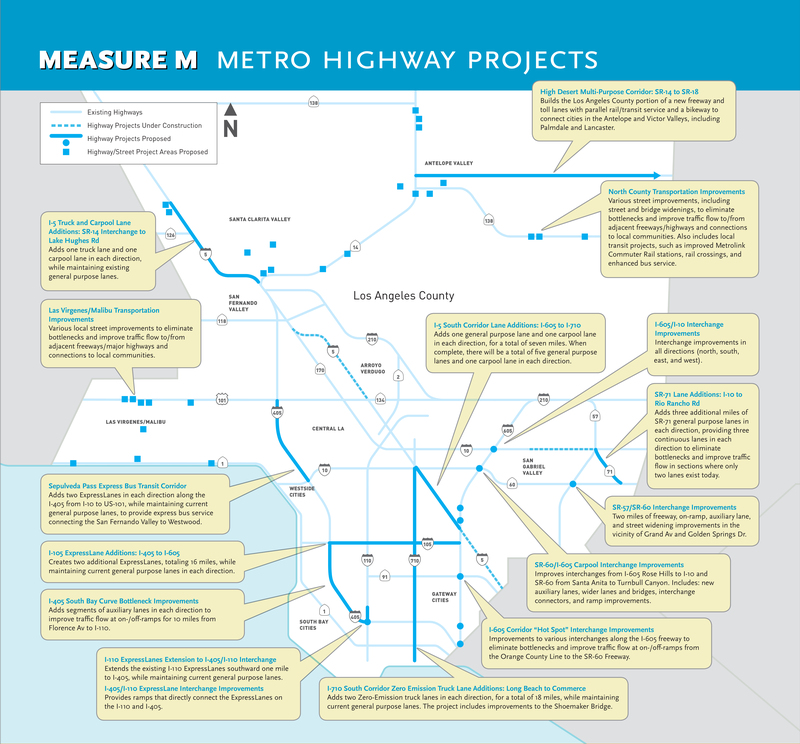 Measure R is a half-cent sales tax for Los Angeles County to finance new transportation projects and programs, and accelerate those already in the pipeline. The tax took effect July 2009. Measure R alone does not fully fund all projects. The Measure contains an Expenditure Plan that identifies the projects to be funded and additional fund sources that will be used to complete the projects. 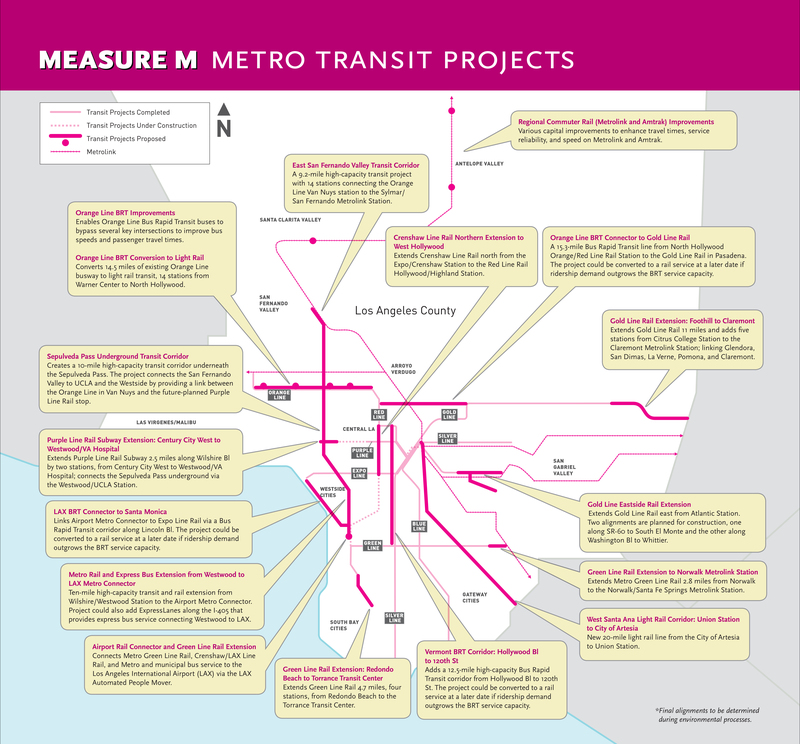 The Measure R Expenditure Plan devotes its funds to seven transportation categories as follows: 35% to new rail and bus rapid transit projects, 3% to Metrolink projects, 2% to Metro Rail system improvement projects, 20% to carpool lanes, highways and other highway related improvements, 5% to rail operations, 20% to bus operations, and 15% for local city sponsored improvements. All Measure R funds will be spent in accordance with the plan approved by voters. There will be an annual independent audit and report to taxpayers and ongoing monitoring and review of spending by an independent taxpayer oversight committee. Prior to any approval and commencement of any Measure R project, any necessary environmental review required by the California Environmental Quality Act (CEQA) shall be completed. How much money would it generate and for how long? Exactly what major new transit and highway projects will the money fund? Will local jurisdictions receive revenue from this tax? What is the yearly cost to individuals here in LA County? What are the economic impacts of Measure R? How do we know the money will be spent on transportation improvements? How is the revenue distributed among the County’s different sub-regions? If there’s no project in my immediate neighborhood, how does Measure R affect my neighborhood? How much of the revenues generated go for Metro administrative costs? Are there already transportation sales taxes in LA County? How has the money been used from those sales taxes? How is the sales tax imposed? 1. What is Measure R? Measure R is a half-cent sales tax for Los Angeles County that finances new transportation projects and programs, and accelerates many of those already in the pipeline – everything from new rail and/or bus rapid transit projects, commuter rail improvements, Metro Rail system improvements, highway projects, improved countywide and local bus operations and local city sponsored transportation improvements. The measure garnered the minimum two-thirds vote in the November 2008 election and became law January 2, 2009 with the tax taking effect in July 2009. 2. How much money would it generate and for how long? Measure R is expected to generate $40 billion in new local sales tax revenues over 30 years. 3. Exactly what major new transit and highway projects will the money fund? Measure R is expected to contribute funds towards the Expo light rail line on the Westside, the Regional Connector in Downtown Los Angeles, the Crenshaw/LAX Transit Project, the Eastside extension of the Metro Gold Line, the Foothill Extension of the Metro Gold Line, a rail connection to LAX, a Green Line Extension to the South Bay, a San Fernando Valley I-405 Corridor transit project, North-South Corridor transit project in the San Fernando Valley, a West Santa Ana Branch corridor project and the Purple Line Extension. Highway projects projected to receive funds include grade separations, soundwalls, high dessert corridor, I-5/SR-14 interchange, I-5 from I-605 to the Orange County Line including the Carmenita interchange, I-5 from SR-134 to SR-170, operational improvements in Arroyo Verdugo and Las Virgenes/Malibu, South Bay freeway ramp and interchange improvements, I-5 capacity enhancements north of SR-14, I-605 hot spot interchanges, SR-710 North gap closure, I-710 South, and SR-138. In developing Measure R, the Metro Board of Directors approved an expenditure plan detailing how all of the funds will be spent. Measure R does not fully fund all projects. The expenditure plan identifies additional funding sources. 4. Will local jurisdictions receive revenue from this tax? Yes. Beyond the specific projects cited in the expenditure plan, the region’s 88 cities and County unincorporated areas will receive 15% of all sales tax revenue for local needs such as major street resurfacing, rehabilitation and reconstruction; pothole repair; left-turn signals; bikeways; pedestrian improvements; streetscapes; signal synchronization; and transit service improvements. In addition, 20% of the sales tax revenue will subsidize County-wide bus operations. 5. What is the yearly cost to individuals here in LA County? The private nonprofit Los Angeles County Economic Development Corporation (LAEDC) estimates that the tax increase would cost each resident an average of $25 per person annually. 6. What are the economic impacts of Measure R? 7. How do we know the money will be spent on transportation improvements? To determine compliance by Metro with the provisions of this new sales tax measure, the ballot measure calls for an annual independent audit and report to taxpayers, plus ongoing monitoring and review of spending by an independent taxpayer oversight committee. 8. How is the revenue distributed among the County’s different sub-regions? The highway, bus and rail projects identified in the expenditure plan are spread throughout the County. In addition, each of the individual cities and unincorporated areas within Los Angeles County receive a share of the revenue to use at their discretion for local transportation needs. 9. If there’s no project in my immediate neighborhood, how does Measure R affect my neighborhood? All of the region’s 88 cities and unincorporated areas receive a portion of the sales tax revenue to use at their discretion for local needs such as major street resurfacing, rehabilitation and reconstruction; pothole repair; left turn signals; bikeways; pedestrian improvements; streetscapes; signal synchronization; and transit service improvements. 10. How much of the revenues generated go for Metro administrative costs? The measure limits Metro administrative costs to no more than 1.5% each year. 11. Are there already transportation sales taxes in LA County? Yes, there are currently two half-cent transportation sales taxes in LA County. 12. How has the money been used from those sales taxes? Los Angeles County has expanded bus and rail service, freeway carpool lanes and local street improvements over the past decade from the revenue generated by the existing sales taxes. Those projects have helped to meet the increasing transportation needs generated by the region’s major growth in population, employment and goods movement. Metro is now the third largest public transportation system in the nation, carrying 1.6 million passengers on an average weekday, along with the world’s largest network of freeway carpool lanes. 13. How is the sales tax imposed? The sales tax is imposed in the same manner as existing sales taxes. The sales tax is imposed upon all retailers in the incorporated and unincorporated territory of the County of Los Angeles on gross receipts of the retailer, as well as an excise tax on the storage, use or other consumption of tangible personal property purchased from a retailer. 14. How long will it take to complete these projects? There are short, medium and long-term traffic improvements. Street resurfacing and deployment of additional bus and Metrolink service can be done relatively quickly. Construction of new busways, light rail lines, highway and subway projects can take up to five years or longer. The expenditure plan spreads out the anticipated funding with some projects being built in the early years and others being built in the latter part of the 30-year sales tax period. Mayor Antonio Villaraigosa explains his greater vision to build a 21st Century Transportation System for Los Angeles.